Three years ago, Ohio Ministries was invited to work with First Church of God in Sidney, Ohio, to help the church address the need for turnaround. This began a journey toward a new future. Pastor Alan Leach began feeling the stirring of the Holy Spirit to leave his growing church and take on the challenge of pastoring a turnaround church. He prepared himself through prayer, study, attending the Ohio Ministries Turnaround Church Boot Camp, and hiring a coach. So when Pastor Alan Leach and the Connection Point Church (formerly Sidney First Church) joined forces last Easter, they began with a commitment to do whatever it took to turn the church around and be a “Great Commission Church.” After an intensive period of prayer, training, and planning, the church is now on a journey to becoming that new church. In the last eight months, Pastor Alan reports that attendance has nearly doubled. On Christmas Sunday, they had an attendance of 250. Their “Christmas Eve Eve” service saw 256 persons celebrate the birth of our Lord. And the first Sunday of this year drew 234 persons—nineteen were kids, fifth grade and younger. They are encouraged! 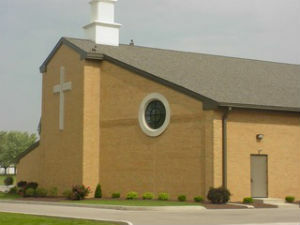 When asked what is helping to make the difference, Pastor Alan said, “Our folks are investing in and inviting their friends, family, coworkers and neighbors.” To illustrate the enthusiasm of the folks of the church, he told of a person who decided to invite their neighborhood (about seventy persons) by giving out microwave popcorn bags with a label inviting them to church. These simple acts of friendship are major factors in helping this church become a new church of hope and good news in their community. Join the Connection Point Church and Risingsun Church in prayer, that the Lord would continue to grow the churches as they live on mission! An ordained minister in the Church of God, Esther’s ministry experience includes partnering with her husband Chris to serve as co-pastor of Southside Church of God in Muncie, Indiana; associate pastor at Barberton Church of God in Barberton, Ohio; associate director of Christian education at Ohio Ministries; associate pastor at the Ansonia, Ohio, First Church of God; and serving as a chaplain in hospice there. In February 2007, Esther joined the Ohio Ministries staff as associate director. Her efforts have focused on church multiplication, developing the next generation of leaders, and coaching pastors and congregations toward sustainable health and growth. Esther completed her doctorate of ministry from Talbot School of Theology, Biola University. The emphasis of her study was “Growing and Multiplying Churches in North America.” Esther and her husband Chris have two grown sons, Nathan and Aaron. Learn more about Ohio Ministries of the Church of God at www.ohchog.org. Learn more about the Church of God at www.JesusIsTheSubject.org. This entry was posted in All Church of God, Great Lakes and tagged Alan Leach, Connection Point, Esther Cottrell, Girton, growth, multiplication, Risingsun, Robin Hindall, Sidney. Bookmark the permalink.